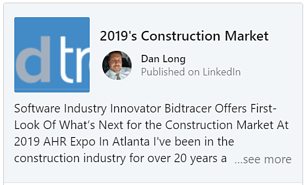 In this LinkedIn article Dan Long shares how, in his 20 years of experience in the industry with companies like Johnson Controls, Climatec, and now Koman Construction, he's never seen anything with the potential to transform the business operations of Subcontractors that is as powerful as Bidtracer, which was featured in CIO Review's 2017 Top 20 Tech issue. He also shares about a few conversations he's had with Bidtracer's Executive Team where they discussed Bidtracer's incredible growth over the past few years and what big plans they have in store for the future! CHECK OUT THE ARTICLE HERE ON LINKEDIN!